I’ve been having a bit of trouble lately trying to find new and different illusions to feature on the site. I’ve realized that there are only so many illusions out there, and they aren’t exactly being created at an industrial rate. Today, I have a pretty simple lines optical illusion for you. It’s plain, black and white, and straightforward. 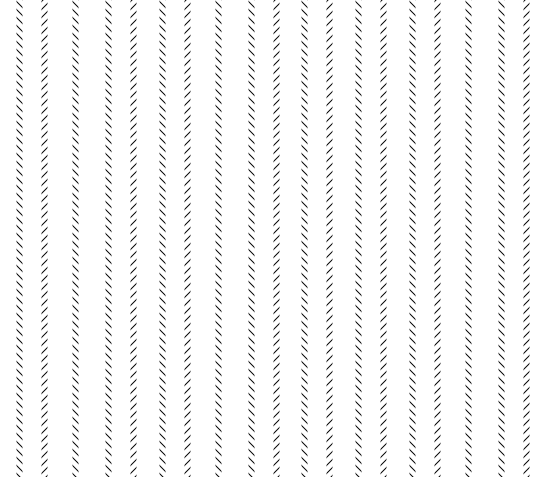 Today’s lines optical illusion has no bells and whistles and it’s modeled after several classic lines optical illusions. ow, all you have to do is look at the lines optical illusion above and ask yourself—”are the lines straight and parallel?” The answer of course, is that even though they appear to be at an angle or bulging, the lines above are perfectly straight up and down and parallel to one another. They only look crooked because the patterns used to create each bigger lines are made of smaller diagonal slanting lines. Why such a simple crooked lines optical illusion today, you ask? Well, because the line illusion above is the first optical illusion I’ve made so far! I figured I’d start out small and work my way up to making larger illusions. I’m a savvy kind of blogger—if I can’t find something, I’ll make it! Feel free to try your hand at making your own optical illusions too! Maybe I’ll start featuring some of y’all’s own original illusions! Just submit them via the Mighty Optical Illusions Facebook page. If you liked this crooked lines optical illusion, head over and tell me—are the purple lines straight or bent? Next Is it a Swan or Squirrel? ?